A long time ago, in a galaxy far, far away, Han Solo avenged the destruction of an innocent planet by helping Luke Skywalker blow up the Death Star. Han walked away with a gold medal and the love of his life. But when Solo Hahnnamed in honor of the beloved action herotries to avenge the death of his gray-and-white kitten, he gets eight months of community service. Eight months of working at the local raptor center helping owlshis now sworn enemies. For the first time in his life, Solo is labeled a troubled kid, an at-risk youth. He’d always gotten good grades, had good friends, and gotten along with his parents. He used to volunteer to read Reader’s Digest to old people at the retirement home next door, and his favorite thing in the whole wide world was to surf. He wrote screenplays for fun. But when his parents uproot him and move the family from California to backwoods Oregon, Solo starts to lose track of the person he was. Everything is upside down, and he finds himself dealing with things way beyond his understanding. He’s the new kid in town, and he’s got a bad reputation. The question is: What will he do next? This is a story about staying true to yourself when things get tough. Solo has every reason to lash out, but he ultimately needs to find a way to cope. 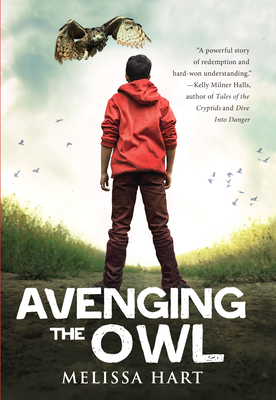 Avenging the Owl deals with the difficult issues of suicide and depression, but more than anything it captures the powerlessness of being a kid. It won’t be easy, but the wild beauty of Oregon, its cold, empty beaches and captivating wildlife, may be just what Solo and his family need to help them start over. Melissa Hart is the nonfiction instructor for Whidbey Island's MFA Program in Creative Writing. Her articles and essays have been published by the Washington Post, the Los Angeles Times, the Boston Globe, Writer’s Digest, and many others. Melissa currently resides in Eugene, Oregon, where she can hear western screech owls in her backyard.